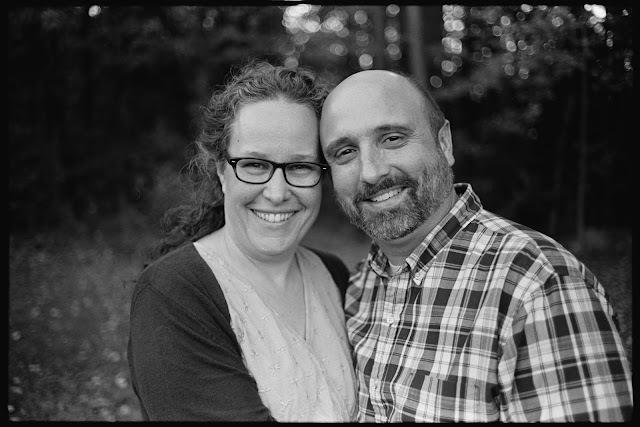 Proverbs: "A wife of noble character who can find?" 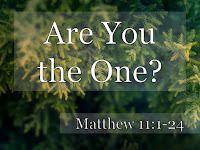 Verse 1 of Matthew chapter 11 indicates a transition in the Gospel of Matthew. 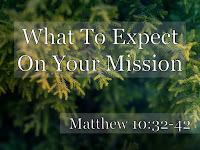 Chapter 10 was all about the mission that Jesus was giving His apostles and what they could expect to happen to them when they went on that mission. And it wasn’t all good and happy and positive. Jesus told them, in fact, to expect opposition. To expect hostility. And one of the reasons why was because Jesus, their lord, would be experiencing hostility Himself. And really in chapter 11 and 12 that hostility begins to really heat up. We already know where that hostility ends up. It ends up culminating on an old rugged cross outside of Jerusalem. Jesus has met some opposition so far, but from here on, it really builds. And it begins to force some people to rethink Jesus. We met him back in chapter 3. This is the guy who baptized Jesus and then the Holy Spirit came down like a dove and the voice of God the Father gushed over His Son. Well, chapter 4 verse 12 told us that John had been put in prison. Herod Antipas put John into prison for preaching all this stuff about repentance. And I’m not sure how much time has gone by, John is still in prison. And he’s starting to have some questions and some doubts. I mean, he knows what he’s seen and what he’s heard, and he believes it all, but he’s starting to think that maybe he has misinterpreted what he has seen and heard. And he can’t get out of prison to ask his questions, so he sends some of his followers to ask Jesus one key question. Let’s read verses 1 through 3. Let me ask you a question as we get started here. Is Jesus who you thought He was? Has your understanding of who Jesus is changed over time as you’ve gotten to know Him? Now, some of you, I’m sure would say that you’ve just about always had the same idea of Who Jesus is though it’s grown and matured and strengthened over time. You were well taught from infancy. So the Jesus you thought He was, as you got to know Him in the Bible and in your own personal relationship with Him is just about the same as you always expected Him to be. But many of the rest of you would probably say that you’ve been pretty surprised to find out Who Jesus really is. What Jesus is really like. As you read the gospels, you get a very different picture than what you had always expected. Jesus often turns our expectations upside down. He doesn’t do what we always thought He would do. I think that’s at the heart of John’s question. The first thing I want you to see is that it’s okay to have doubts and questions. We’re going to see in a moment that Jesus thought very highly of John. He doesn’t get mad at John in the slightest for airing his doubts and asking his questions. It’s okay to have questions and to try find answers. Some of you here have big questions about Jesus. And about whether this whole Christianity thing is true or not. That’s great. I’m glad you are asking your questions. And I’m glad you’re here today. There are answers for your questions. Don’t be afraid to ask them. Notice what John does with these questions. He takes them (or sends them as the case may be) to Jesus. This is not unbelief. He doesn’t talk Jesus down or run away from Jesus because of his questions. He goes to Jesus with his questions. I think it must have been hard for John to languish in prison like that when the Messiah was supposed “set the captives free.” Right? And John had said that the one who was to come would baptize with the Spirit and with fire. The one who is to come is supposed to have a winnowing fork and clean house and gather the wheat and burn up the chaff. Do you feel that question? Do you sometimes wonder if Jesus was Who He was supposed to be? If Jesus is ___________, then how come He __________ ? Is Jesus who John thought He was? What is the answer to that? We already know the right answer. Everybody in this room knows the right answer. For 126 years this church has stood for the right answer to that question. But at the moment, John wasn’t so sure that he had it right. And it’s a really important question. There are few more important questions in the whole world. Everything rides on it. Here’s how Jesus answered. Verse 4. I think that’s a YES. Jesus doesn’t come out and say it. He shows it. He says, “What is the kingdom supposed to be like? What did Isaiah 35 say? What did Isaiah 61 say the kingdom was going to be like? Was it the blind being able to see again? Was it the lame being able to walk again? Was it the lepers being cured? Was it the deaf being able to hear again? Was it the dead coming back to life? Was it the poor hearing the gospel? Well, those things are happening right here, right now because I am here. And I believe from that moment on John the Baptist did not falter. Now, you and I knew that was going to be the case already. So, I want to focus on the results of getting the answer right and on getting the answer the wrong. Because that’s where Jesus goes with it next. Did you see that big powerful word in verse 6? Same word as the sermon on the mount. Same word as the beatitudes. We translated it “flourishing” a few months. Flourishing is the man who does NOT fall away on account me. Flourishing is the person who decides that even if Jesus seems different than they initially expected, they will stick with Him to the end. The person who answers the question “Is Jesus the One Who was to come?” with a big old YES will be BLESSED. Now, there’s a mild rebuke there. Or at least a warning to John to not fall away. To not bail on Jesus halfway there. On account of Jesus not being what he thought Jesus would be like. Don’t go there, Jesus says. Because if you go there, you won’t get this blessing. That’s where the flourishing is. That’s why this church is centered on the Person and Work of Jesus. For 126 years we have sought to glorify God by bringing people into a life-changing relationship with Jesus WHAT...Christ! Messiah! We have proclaimed to this community that Jesus Christ is the One Who was to come. And that if you trust Him and not fall way, you will be unimaginably blessed. That’s the gospel, isn’t it? And that’s what we are all about and have been all of these years. And that’s what we are about today. Do you know Jesus as your own Lord and Savior? Do you know Jesus as your Messiah and King? Then you will be blessed. You will find life. Eternal life. And eternal flourishing. Even if you have to go to prison and they chop off your head. Because that’s what’s going to happen to John in chapter 14. But I’m sure that He was blessed. And I’m sure that He is flourishing right now and will forever. “As John's disciples were leaving [with Jesus’ answer for him], Jesus began to speak to the crowd about John: ‘What did you go out into the desert to see? A reed swayed by the wind? [I doubt it. John was not a weather-vane, a weak man who did what others expected him to.] If not, what did you go out to see? A man dressed in fine clothes? [Like a slick and smiling televangelist?] No, those who wear fine clothes are in kings' palaces. [And this guy did not wear fine clothes. And he is in the king’s jail, not his palace.] Then what did you go out to see? A prophet? Yes, I tell you, and more than a prophet. You see how He talks about him? He’s not mad at John. He thinks John is the greatest man who ever lived up to this point. Because John has been, all along, pointing people to Jesus as the Messiah. Because John knew the right answer to this question and had dedicated his life to telling people about it. Do you see what He’s saying? He’s saying that John stood at a very special place in history. He was the last prophet of the Old Testament and He got to tip everybody into the New Testament. John was the fulfillment of that passage in Malachi that Peter preached here a couple of weeks ago. Malachi 4. He came in the spirit and the power of Elijah. Yes, Jesus is the One Who was to come! Now, don’t miss what Jesus said about you and me in verse 11. Let’s come back to it in a minute. It’s so good, we’ll end with it. But, first, let’s consider what happens if you answer this question incorrectly. What happens if you get it totally wrong? Well, it’s the opposite of blessing. It’s cursing. It’s judgment. It’s trouble and danger and woe. And the other spoiled group doesn’t play along. “No way am I going to do what this Simon guy says! Nothing makes them happy. They are full of excuses. Always an excuse. They were rejecting both John and Jesus. Even though wisdom would say that they were obviously telling the truth. These people wouldn’t play God’s game, no matter what. If you ultimately answer this question with “No,” then it will be woe for you. Notice a couple things about this passage. Jesus knows what might have been. Jesus knows what might have been under different circumstances. He knows every move on the chess board and what would happen if different moves were made. Every contingency. He doesn’t normally tell us. And that helps me to trust Him. Notice also that Jesus thinks that He is a very big deal. Well, obviously, from this passage Jesus thinks that our eternal destiny hinges on whether or not we believe that He is the one was to come. And these cities who saw Him do the miracles were rejecting Him. And Jesus says that they did so at their own peril. Notice also that you can see miracles and not believe. Miracles don’t guarantee faith. They can strengthen faith. They can point to what to believe. But they can always be ignored or explained away or rejected, too. And also notice that the fire is still to come. John the Baptist wasn’t wrong about the fire. He wasn’t wrong about the winnowing fork or clearing the threshing floor or the chaff being burned up. He just didn’t know the timing. When Jesus came the first time, He came to save. When Jesus comes again, He will rescue His people, but He will come to judge. Woe to you if you answer this question wrongly. That day of judgement is still to come. For 126 years, this church has proclaimed salvation through Jesus and the return of Jesus to fulfill all of God’s promises and all of God’s threats. If you ultimately answer the question “Is Jesus the one who was to come” with NO, there will be nothing for you but woe. The fire is still to come. If that’s you right now, I call upon you to repent. To turn and trust in Jesus. Because He is everything He was promised to be. And so much more. And if you do, you will be blessed. You will flourish both now and forever. Let’s go back to verse 11. You and I are in verse 11. Did you know how blessed you are? If you are in the kingdom of heaven, you are greater than John the Baptist. Even if you are the least in the kingdom, you are greater than John the Baptist. John did not live to see the Cross or the Resurrection. He only could see it from before. We live on this side of the Cross and the Empty Tomb. The New Covenant is not just promised but in effect. The Holy Spirit that John foretold, has come, and is in you right now if you are a believer! Lanse Free Church, every believer here is greater than John the Baptist, and that’s saying a lot. Not because we are so great, but because Jesus is the One Who was to come. And that’s because it’s a major teaching from Jesus on missions! At the end of chapter 9, Jesus saw the crowds harassed and helpless like sheep without a shepherd, and he had compassion on them. And in Matthew chapter 9, verse 38 (which is the reason why many of us are praying every day at 9:38am) Jesus told His disciples to ask the Lord of harvest to send out workers into His harvest field. And then in chapter 10, He sends out some workers into the harvest field! He calls 12 men to Himself and then sends out them as apostles, authorized representatives, emissaries, ambassadors, special agents on a special mission for Jesus. And we noticed the last two times that Jesus seems to be teaching about more than just that first short term missions trip. He seems to also be preparing them for the mission that He’s going to give them at the end of the Gospel of Matthew (which we often call “The Great Commission”) and He seems to be preparing them for what it’s going to be like in the Book of Acts and what it still is like for those of us who are on mission for Jesus today. He summarized the whole thing in verse 16. Which should be familiar by now. Remember the four animals? Sheep, wolves, snakes, doves. That’s us. Well, aside from wolves. We’re supposed to watch out for them. But we’re supposed to be trusting and vulnerable like sheep. Shrewd and wise and strategic like snakes. And innocent and pure and loving like doves. As we go out on this mission. And as we go out on this mission, we are supposed to shout the gospel message from (v.27) the rooftops. I wouldn’t get on this new roof up here, you might slide off. But we are supposed to be bold and share the good news about the coming kingdom and the coming King! We are sent as sheep among wolves. That’s a dangerous way to go. Sheep among wolves. Remember that? Beware, but don’t be scared. Because we are not sheep our own. We have a good Shepherd. And He knows us. Even the very hairs of our heads are numbered. And we are worth more than many sparrows. And He has His eye on every one of them. I think these last eleven verses are basically a summary of what Jesus wants His disciples to anticipate this mission being like. What they should expect to happen as they go out on mission for Jesus. Because I think that’s how Jesus is landing this plane. That’s how Jesus is ending the mission discourse–He’s laying out for the disciples what they can expect to happen to them as they go out on His mission both then and, for us, now. I see three main things, and I’ll tell you right up front, that they aren’t all happy ones. They are not all positive. In fact, all three of them have difficult parts to them, and one of them is really really hard. This is fair warning for disciples. Do you think you want to be a disciple of Jesus? Do you think you want to follow Jesus and be on mission for Jesus? But you need to know that it’s not always easy. It’s not just a walk in the park. And Jesus tells us that. He doesn’t hide the fine print. Here’s what to expect on your mission. #1. EXPECT TO BE RECOGNIZED AS JESUS’ OWN. And this is, I think, the most amazing one of the three. Expect to be recognized as Jesus’ own. And that’s by God Himself. Look Matthew chapter 10, verse 32. That word “acknowledge” could be confusing to some of you. Because we often use it for a nod of the head. Yup. I see you. I acknowledge you. You’re over there. Uh huh. And that might work for some of you, but some of you use the word “confess” mainly to admit to wrongdoing. And that’s not what He’s getting at here either. I think the flipside in verse 33 makes it clear what He’s talking about in verse 32. That’s what Jesus means by acknowledge. It means to claim Jesus as your own. To claim to belong to Jesus. To own Jesus as your Savior and your Lord. To tell people about Jesus’ saving work and coming kingdom. When we tell people that we own up to Jesus–we are with Him. Jesus tells HIS FATHER IN HEAVEN that He owns us–that He is with us! I don’t think we can wrap our minds around how astonishing that is. First off, notice Who Jesus thinks He is! Jesus believes He has a special filial relationship with God. He is God’s own Son. And because He is God’s Son, whomever He brings to the Father and claims as His own, the Father will also recognize as His own! Because Jesus is God’s Son, whomever Jesus brings to the Father and claims as His own, the Father will also recognize as His own! Of course the flipside is also true. Whomever Jesus does not recognize as His own, the Father will also not recognize as His own. And that’s true of those who disown and deny any connection with Jesus. Jesus has just told them how hard it’s going to be. They will be dragged before the authorities. They will be flogged. They will be chased from city to city. They have the authority to preach the gospel and do miracles of the kingdom. But they don’t have the authority to fight back for that kingdom. They are sheep among wolves, not wolves among wolves. And they are going to be tempted to disown and deny any connection with Jesus. Because if they don’t, it will hurt. We don’t feel it as much in our day in this country. Right now, Christianity still enjoys a good deal of public approval, even a privileged status. But in many places in the world, if you belong to Jesus and you own it in public, you will pay for it. And it’s increasingly the case here. And it will probably get worse. Regardless, we are all tempted to be quiet about Jesus from time to time, and we aren’t even afraid that others are going to hurt us. We’re just afraid they’re going to laugh at us or make fun of us or think less of us. So we’re tempted to stay quiet. But we have a mission. We have a job to do. It’s our job to tell people about Jesus. We need to own Him. To recognize Him publicly as our Lord and Savior. Talking to people about OUR OWN Savior and Lord. And get this, when we own Jesus before men, Jesus owns us before His Father in heaven. It’s wonderful thing to expect as you live your life on mission for Jesus that Jesus is holding up your name to His Father. We can’t begin to understand how great that is. Now, some, when they read verse 33 think about the Apostle Peter and what He did. He disowned Jesus, didn’t he? Three times he denied Him. And that’s true, He did. But he didn’t stay there. He didn’t stay a disowner. He repented and returned to Jesus and asked for His forgiveness, and then he acknowledged Jesus everywhere he went. So, if you have disowned and denied, don’t stay there. If you stay there, the other side of verse 33 may become a reality for you forever. “I will disown him before my Father in heaven.” I would hate for that to be said about anybody here. So don’t stay there. It isn’t safe. Trust in Jesus. Take Jesus as your own Savior and Lord. And tell other people about Him. Here’s the application of this one. - Own Jesus As Your Lord. Don’t be ashamed of Him. Don’t be afraid to talk about Him. Don’t be scared to claim Him as your own. Because as you do, He’s claiming you as His. #2. EXPECT TO BE REJECTED BY THE WORLD. I’d rather by rejected by the world than by the Lord, wouldn’t you? But it’s still not easy to be rejected by anybody. That’s why Jesus warns us in advance what it’s going to be like. Verse 34. That’s a quote from Micah 7:6. Jesus loves the Old Testament and Matthew loves to show it. Jesus hasn’t come to bring peace, He says, but a sword. Now, I know that He’s not calling them to pick up swords. They are sheep among wolves. They are not to go on attack. But because of Jesus, they will be attacked. I know, I know. This is hard one to swallow. Especially because we know that Jesus DID come to bring peace on earth. The angels said that at His birth! He’s the prince of peace. He just taught us to be peacemakers in the Sermon on the Mount. And on the night He’s betrayed, He says that He gives His disciples peace. But that’s not all He brings. Because the world (not everyone but so so many, the world) will reject Him. And if they reject Him, they reject us. The world gets hostile about Jesus. Sometimes the world gets all excited about a fake version of Jesus that they can use to their own ends. But when the true Jesus shows up the world starts to squirm. And give them enough time, and they will get downright hostile. The peace on earth will come, but it’s not automatic. And it’s...later. In the short run, Jesus divides families. I’ve seen it right here in Clearfield County. Sometimes, our Kids for Christ are handing out water bottles and invitations to Family Bible Night and I’ve seen a dad make his kids return the water bottle, the pencil, and the invitation because he doesn’t want any of that Christian proselytizing. Imagine if that kid comes to Christ, what it might be like in that home? This is the worst kind of rejection–at the family level. But you can see it elsewhere. It is not always popular to be a Christian, to own up to being a follower of Jesus. Jesus divides people. He just does. And most of us don’t like to be rejected. We like to be liked. I mean Facebook and Twitter and Instagram feed off our love of being liked, right? Look how popular they are. But Jesus says, if you are on mission for Me, expect a lot of rejection from the world. - Love Jesus More Than Anything. More than your own family. Verse 37. It doesn’t mean that we can somehow live in a way that we deserve Jesus. We can’t. Salvation is all of grace. But if we have been graced by Jesus, then we will put Him absolutely first. Let me ask you a trick question about verse 37. Ready? Can you love both Jesus and your family? I guess it wasn’t a trick question. Let me ask this one. Can you love both Jesus and your family equally? No. Jesus calls us to love Him MORE. In the Gospel of Luke, He says that the difference should be so great that you could basically say that we hate our families. Not because we hate our families, but because of how much more we are to love Jesus. Do you love Jesus that way? Do you love Jesus MORE than anything? What an astonishing metaphor–to take up your cross and follow Jesus. This is long before Jesus takes up His own cross, though we can read it in light of that now. But Jesus said it before He even took up His cross. Jesus says that we must die to ourselves. We must go on death march and count ourselves as dead. To say with our lives that following Jesus is the most important thing. That we love Jesus more than we love our lives. This is just another way of talking about repentance and faith. Turning away from sin, and self and Satan and turning to Jesus for true and lasting life. Jesus is calling us to love Him more than anything including our very lives. Jesus loved us more than keeping His own life. What are you tempted to love more than Jesus? In your heart right now, hold it to Jesus and give it to Him. Repent and turn. And give it up to Him. You’ll have to do it again. Tell Jesus that you want to love Him more than anything. More than your very life. Because that how He loved you. One last one and then we’re done. What to expect on your mission. #3. TO BE RECEIVED AND BE REWARDED. It would be enough to just be recognized by Jesus, wouldn’t it? But it goes deeper and more wonderful. Verse 40. Not everyone is going to reject us when we live out this mission. Some people are going to receive us and receive our gospel message. And Jesus says that when they receive US, they receive Him. Because we are intimately connected! We’re are just that close! 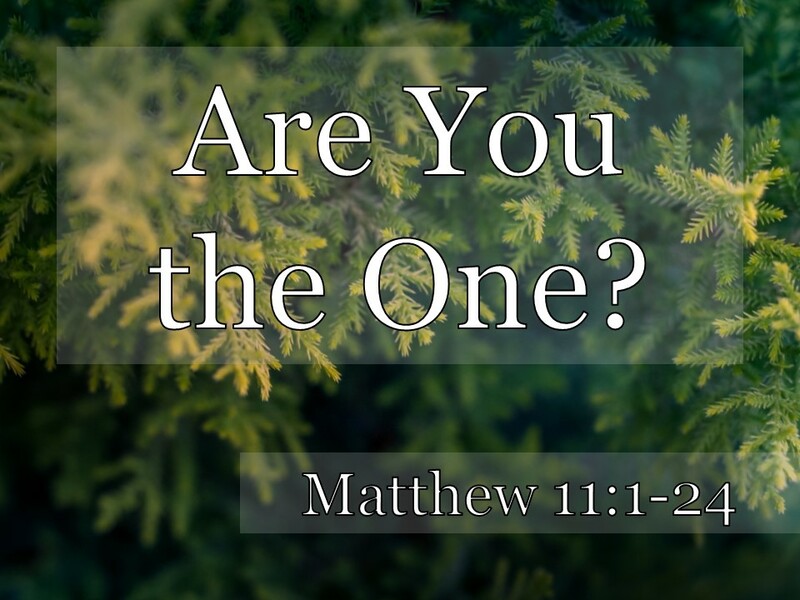 You and Jesus are One! You aren’t just recognized by the Father. You are vitally connected to Him. So that if someone receives you, they are receiving HIM! What a privilege that is! We are emissaries of the King. We are ambassadors of King Jesus. And we are the ambassadors of His Father. If they receive us, they are receiving HIM. Jesus elaborates in verse 41. You see how liberal Jesus is with the rewards? He’s handing them out left and right. If you should get a reward for living righteously or speaking God’s words or just for following Jesus, you’ll get it. And you’ll get it just for receiving someone who should get it. And supporting someone who should get it. This is a great reason to support missions and missionaries. When someone on that back wall gives out the gospel to someone who receives it in faith, they get rewarded and they get rewarded, and WE get rewarded for supporting them. This is a great reason to support missions and missionaries and to live on mission ourselves. And to help each other to live on mission together. - Live for Jesus’ Reward. He obviously wants us to, or He wouldn’t talk about it so much. This could take so many forms. Preaching the gospel from the rooftops. Owning up to belonging to Jesus in our spheres of influence. Giving money to overseas missions. Filling a little shoebox with gifts for the needy around the world. Every one of those shoeboxes gets a gospel message embedded in it and given to children who need the hope of the gospel. I don’t know about you, but I want all of the rewards that Jesus wants to give me. I don’t want to miss any of them. It would be enough to just be recognized as belonging to Jesus in the eyes of His father. But He has more for us. If we will trust Jesus and love Jesus more than anything and serve Jesus and receive and support those others who belong to Jesus and are on mission for Jesus, then we will be rewarded beyond what we can understand and imagine. That’s what we can expect on this mission that Jesus has for us today. This is my first experience of “Virgil Wander,” and I hope he’d appreciate these adjectives. 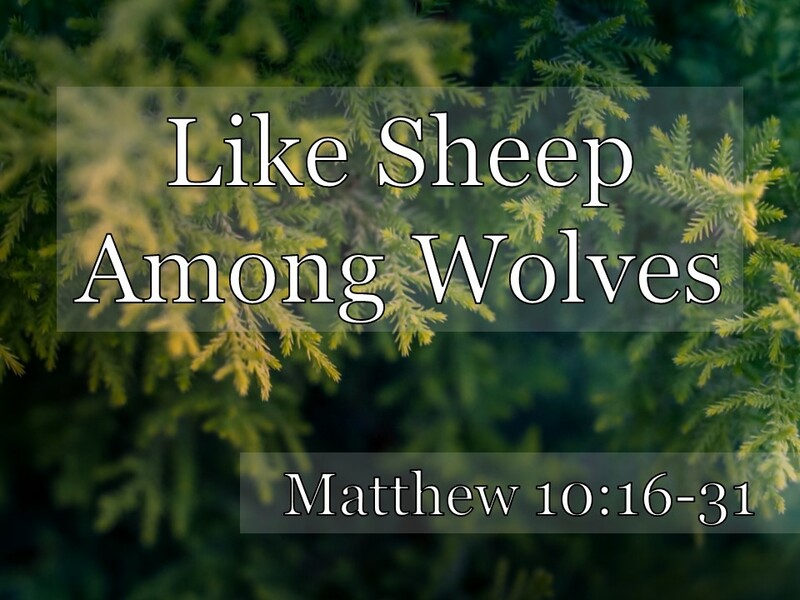 Today, we’re picking back up and Following Jesus in Matthew chapter 10. 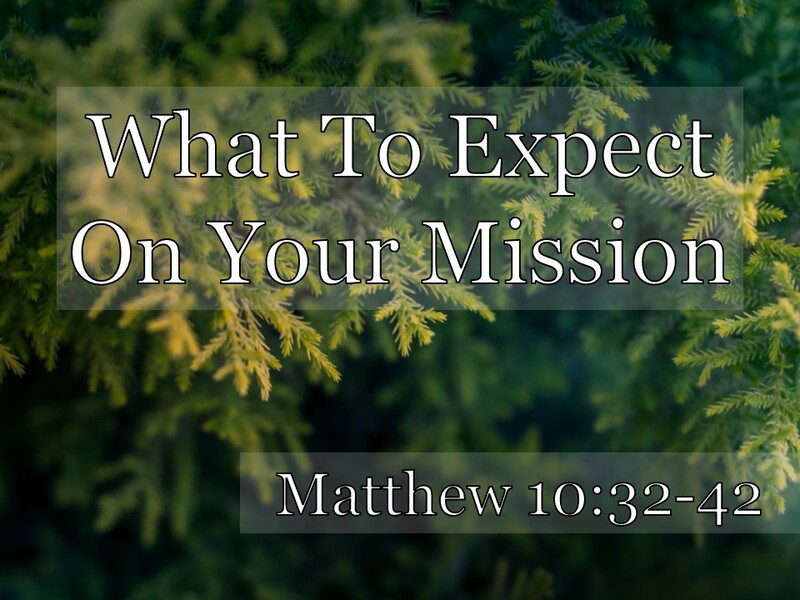 Matthew 10 is often called the “Mission Discourse” or Jesus’ “Major Teaching on Missions” in the Gospel of Matthew. It’s the second of five major blocks of teaching in the Gospel of Matthew. The first was Jesus’ Sermon on the Mount which we spent several months this year studying together. Jesus’ teaching on the upside-down, inside-out, already-but-not-yet coming kingdom of God. And when Jesus came down from the mountain, He started demonstrating His authority. His authority over sickness and demons and creation and even over death and sin. Jesus has all authority. And in Matthew chapter 10, Jesus delegates some of His authority to 12 special agents that He is preparing to send out to the nation of Israel on a mission. At the end of the chapter 9, Jesus saw the crowds, and He had compassion on them because they were harassed and helpless like...what? Sheep without a shepherd. And just like we prayed before the Good New Cruise. And just like we prayed this morning for Church Multiplication Sunday. And just like we’re going to pray every day this week at 9:38, Jesus told His disciples to ask the Lord of the harvest to send out workers into His harvest field. And then He turned around and answered that prayer. He commissioned these 12 workers to go into the harvest field. First, He called them to Himself. And then He sent them out for Himself. As representatives. We called them “special agents” to represent Him and preach about the coming kingdom of God. Do you remember this? Verses 1-15? These 12 had a unique mission. They were to preach, but also to heal the sick, raise the dead, cleanse the lepers, and drive out demons. For this mission, they were to travel light and live on the hospitality of others. And only stay where they were wanted. If they were received, then Jesus was received. But if they were rejected, it was really Jesus they were rejecting, and it would have been better for those people to have lived in Sodom and Gomorrah on the day of judgment. And then we ended with verse 16 which is where I want to pick things up today. Let’s read it. Have you been thinking about that the last few weeks? There’s four animals for you. And the disciples were supposed to be like 3 of them. Sheep, snakes, and doves. They were not supposed to be like wolves. There’s going to be enough of them around! Don’t need any more. Well, that’s a dangerous mission right there, isn’t it? He isn’t sending them out like wolves among wolves. They aren’t supposed to attack the world. They aren’t supposed to be violent or self-serving like a wolf would be. They were supposed to be like sheep. Well, I think, at least, as vulnerable as sheep. Jesus is saying that this mission will be dangerous. It’s not a walk in the park. You are a sheep, and there are wolves out there. Which is interesting because these guys were just given authority to do miracles, right? But they aren’t given authority to blast their enemies to kingdom come. They can do miracles that signify the blessings of the kingdom to come, but they are not given the authority blast their enemies to kingdom come. No, they are sent as sheep among wolves. Which, by the way, is how Jesus came, isn’t it? Now, I also think that the analogy with sheep reminds us of how they trust their shepherd. Sheep are very trusting. They trust their shepherd. So, they are vulnerable, yes, but they are also dependent and trusting. It’s interesting when you think about the Great Commission which this whole book is leading up to in chapter 28, Jesus says that all authority has been given to Him, and He is now sending us, not just to the lost sheep of Israel, but to all of the nations. And He promises as He sends us TO GO WITH US. The Shepherd goes with the sheep! I think that’s significant. Especially when we consider all of the wolves out there! There are wolves out there! But we have a Good Shepherd, and we go with Him. Now, I don’t think that Jesus means for the apostles to be sheepish. To be frightened or scared. Like sheep often are. I don’t think He means that they ought to be exactly like the sheep that are harassed and helpless and lost along the way. That’s why He gives the second sentence. The apostles weren’t supposed to be as shrewd as sheep. They wouldn’t last very long if they were! But they also weren’t supposed to be as innocent as snakes either. Do you catch that? They aren’t supposed to be like a snake in the grass. Sinful, conniving, wicked. They are supposed to be like snakes in just one: smart. Shrewd. Wise. Skillful. Strategic. But as for their character, like a dove. There is so much to chew on here. Now, the rest of this passage unpacks these ideas. Jesus is preparing His disciples for this mission, and He’s making sure that they know that it’s going to be very dangerous, so they need to be very careful. But at the same time, He’s telling them to not worry or be afraid because ultimately they belong to Him. Now, at verse 17, it feels like things change a little bit. It feels like Jesus is not just getting the Twelve ready for their short-term missions trip around Israel, but also getting them ready for what it’s going to be like in the Book of Acts. It seems like He begins to describe things that are going to happen much later even including today. I’m not always sure where He’s getting them ready in particular and when He’s talking to all of us. I think it’s all relevant for us and our mission either way. Let’s listen in. I’ll read a little bit, and you tell me which animals you hear. Okay? Sheep, wolves, snakes, doves. Ready? Verse 17. This sounds like the Book of Acts to me, not just their mission to the lost sheep of Israel, but also when they end up witnessing to the Gentiles. Which animals do you hear? Wolves? Oh yeah. Being handed over. Flogging. Brought before governors and kings. That does not sound like fun. Yes. Jesus says, “Be on your guard.” That’s being shrewd. Know that this is coming and take appropriate action. Yes. Why are they being drug before these authorities? Is it because they are bad guys? Because they are doing bad things? No! Verse 18, “On my account,” for My sake, Jesus says. Because you are following me, you will get in trouble. But when you do, don’t worry. Oooh. Doesn’t that sound good? Beware, but don’t be scared. Be wary, be careful, be shrewd. But don’t be afraid. Don’t be worried. Don’t live in fear. Is that an easy balance to maintain. No, I don’t think so. I don’t know about you, but I’m much better at doing the exact opposite. Often, I’m not careful, but I am fearful. I don’t exercise shrewdness and strategy and wisdom. And I fall into worry and anxiety and vexation. But Jesus says that we should do the exact opposite. You’re going to get arrested. But don’t worry. The Spirit will give you the words to speak. By the way, this is not an excuse for pastors to not prepare for preaching. This isn’t about the Sunday morning gathering. This is for when you can’t prepare because somebody drug you before the authorities. Don’t worry then! Because the Spirit will have your back. This is the only place that He’s called that name in the Bible, but it’s precious. The Holy Spirit who is so intimately bound up with your Heavenly Father that He’s called, “the Spirit of your Father,” and here He is giving you the words to say. Did this happen in the Book of Acts? It sure did! Let’s read the next section and look for the four animals. V.21. Do you see the four animals? Sheep? Yes. This following Jesus thing is very dangerous. Some people are going to die following Jesus. Wolves? Sadly, yes. And where do some of these wolves come from? From your own family. Brothers betraying brothers. Parents betraying children and children betraying parents TO DEATH. Snakes? Yes. Jesus is getting them ready to be on the move. They aren’t supposed to just stay in one city until they are eradicated. They are free to move on. Be shrewd about this. He’s not giving them the option of quitting, but He’s not telling them that they have to stay in one location until they are wiped out either. Be sent, but be shrewd. How about doves? Why do all men hate these disciples? Is it because they have done something wrong? Do you see that the whole point is Jesus? This is a good paragraph to ask ourselves hard questions about whether or not we love Jesus more than we love our families. If you had to choose between loving Jesus and loving your family, which one would you choose? Let me put it another way to get closer to it. If you had to choose between pleasing Jesus and pleasing your family, which one would you choose? Throughout history, disciples of Jesus have had to choose Jesus over their families and sometimes paying for it with their very lives. In some cultures in the world today, if you come to trust in Jesus, your family will hold a funeral for you and treat you as if you are dead. And in some cultures in the world today, if you come to trust in Jesus, your family will actually try to kill you so that your funeral is real. Now, most of us in the West don’t have to worry about that right now. But we still can make an idol of our family. We can put family first over following Jesus. Jesus says that the blessings of salvation come to those who keep trusting and following Him, standing firm on His promises to the end. Beware! But don’t be scared. Trust in the Shepherd. By the way, I’m not sure about the correct interpretation of verse 23. There are about 6 or 7 common interpretations of that and a few of them make just as much sense to me as others. Perhaps, He meant that He would come to them on this short term mission that they are going out on. That makes sense. Though it’s not clear why He’d emphasize it. A lot of it depends on how much of this teaching was just for that particular mission or for the Great Commission mission. And I’m just not sure. He could mean that they wouldn’t finish their mission to Israel before His death and resurrection. Or it could be talking about how the church must continue to try to reach the Jews throughout the world until the Return of Christ. Any way about it, He’s promising to take care of them. He’s promising that He won’t leave them or forsake them. Even when it gets hard. Does this chapter scare you? All of this talk about flogging? Persecution? Fleeing from one city to another? “Sheep among wolves” is a very uncomfortable metaphor. I’m glad that Jesus tells it like it is! I’d rather that He only told us the happy things. Psalm 23. Lots of grass and still waters. But if there are wolves out there, I want to know. And there are wolves out there! So who is who in this illustration? Who is the master? Jesus Himself. Who are the students? You and me and the disciples. They call our Master the Lord of the Flies. The Lord of the Dung Heap. The top dog demon. What do we expect to be called? What do you expect to be called? I don’t like to be called bad names. But should I expect if my Lord was called Beelzebub? If the wolves call you bad names because you belong to Jesus, CONGRATULATIONS! You are doing something right. You are being a true disciple. Beware if the wolves are happy with you all of the time! Blair Murray died 3 years ago this week. He often told me over 17 years to beware when all men speak well of me. He would say, Pastor Matt, if you aren’t making some enemies because of Jesus, then you are doing it wrong. Now, don’t forget that we must be innocent as doves. Some of us make enemies, not because of following Jesus, but just because we are numbskulls. Innocent as doves. Innocent as doves. They might call you names now, but someday, everything will be made right and made clear. Everything will be clear for what it is. Jesus will not be called Beelzebub. He will be called King of Kings and Lord of Lords. And you will be called by the name that He has given you! Now is the time to speak up. To speak the gospel. To be bold. The gospel message should be proclaimed from the rooftops! We are we proclaiming the gospel from the rooftops?! What you doing to proclaim the gospel these days? I’ve had some neat opportunities recently to share the gospel with people. I haven’t actually stood on a rooftop and yelled it. But I have gotten to tell people the good news. How about you? Are you sharing the gospel with others? Jesus says to not be afraid of those who can only kill you once. Beware of them! But don’t be scared of them. They can only kill you once! I don’t know about you, but that’s not especially comforting to me. I don’t want to be killed even once. But Jesus is worth it. This gospel message is worth it. Jesus is worth dying for. Think about God! Fear God. Worship God. Don’t focus on people. Focus on God. But notice how that fear works out. It’s not slavish fear. It’s not quake in your boots fear. It’s joyful fear that the Lord has you in mind. This is not hyperbole. This is not an exaggeration. God is that sovereign. He is that in control. Every sparrow! And He cares for His children with that kind of great attention! Every hair on your head. Yes, some of us have more than others. But the point is that our Father knows how many. Why would they be afraid? Why would these disciples heading out on this mission be afraid? Well, they would have every reason to. They are going out as sheep among wolves. There are wolves out there! But there is also a Good Shepherd out there. And there is a fearsome loving Father up there! So beware, but don’t be scared. Don’t be afraid; you are worth more than many sparrows. It’s true. There will be people who HATE you and call you names and don’t like what you are telling them about Jesus. And they might be in your family. And you might even die. Like sheep among wolves. But don’t be afraid. Not of them. Focus on your Father and follow Jesus and proclaim from the rooftops what He has done for you. 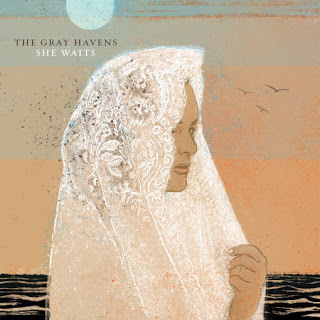 The newest album by our friends, the Gray Havens, is now out! "She Waits" is like but unlike all of their previous work. There is plenty of the explorative, imaginative, cinematic, narrative-based songs we've come to enjoy with Dave Radford lyrics, vocals [lots of falsetto! ], and keyboards and Licia's distinctive counter-point voice coming through. But there are also more instruments here than ever before, fewer guitars or folk-sounds, and some spoken-word poetry from Propaganda (see video below). Now, that's different! Dave explained some of the development of their music in this interview about the song God's Storehouse (which almost sounds like a 50's do-wop, but it doesn't really). My favorite track is "See You Again" which is the most fun funeral song I've ever heard. The whole album is worth listening to on repeat.